Whatever crappiness I feel for whatever reason is put into perspective whenever I visit our programs and talk to our kids. Half of them don’t speak much English at all, all of them are low-income, and few have any support from their families at home, since their parents work two or three jobs to try to make ends meet or have little knowledge of the school system. Sadly, we know from current statistics that many of these new arrival students will not graduate from high school. We work with the school and other nonprofits to try to stem the tide, but there will always be kids whose futures remain uncertain. Lately I’ve been thinking about the distribution of hope and morale in our society. The schools with the highest percentage of low-income kids and kids of color also have the fewest resources, I know this. Their PTSAs are not as active or as well-connected; they can’t raise hundreds of thousands of dollars that could equip their schools with enrichment programs and fieldtrips and new computers. The inequitable distribution of resources is easy to understand, though it is still an uphill battle to change things. But the kids and families also face more subtle inequities. The gap in hope is not something we talk about often. It is intangible, but it is there. A simple example is homework. We don’t think much about homework; homework is a good thing. But I remember what it was like to be a kid who just arrived to the US, who didn’t speak much English. Every day for a long time I would dread doing homework. Not because I wasn’t a good student, but because I had no one at home I could turn to for help. Mom and Dad worked all day and came home late, and even so their English was nonexistent. With homework, kids who have supportive and watchful parents will get them done and feel a measure of pride. For kids who don’t, it can lead to frustrated erasers burning holes in the paper, followed by the guilt and shame of failure and bad grades. Another example is the enrichment programs like art and sports. For many kids, these are things they are good at. Even if your family is poor or you can’t speak much English, you can still be a good artist or singer or soccer player. I remember the first few years after we arrived to the US. By fourth grade, my English was still pretty crappy and I didn’t talk much at all. But I loved art because I was great at it. My stained-glass snowflake, made out of black construction paper and tissue paper, was a masterpiece of geometric genius. When the world was crazy, and it often was, drawing something and doing a good job at it brought some semblance of sanity and balance and self-worth. We know these enrichment programs are great for kids’ morale and motivation for learning. These programs are not frivolous. They keep students wanting to come to school. Especially for kids who face so many barriers, they are critical for giving them a sense of hope. But the lack of resources at poorer schools means that they have fewer of these programs. Seattle World School, with whom my organization partners for many of our programs, understands the importance of imparting hope to kids. They know many students can’t get homework help at home, so there are after-school programs and Saturday morning programs. 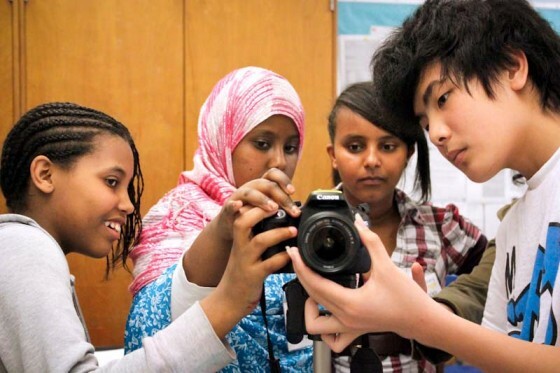 They know the importance of enrichment programs like art and photography, so those programs are prioritized; at SWS, the students are amazing artists and photographers. This is an amazing school. And now the school is under attack. Actually, every couple of years it is under attack. This school keeps getting moved around all over the city, since parents don’t speak enough English or have the same resources to write blog posts and emails to advocate for their school to remain in a stable central location. The school board and various superintendents keep promising to find a permanent home for the school, raising our communities’ hopes, and every couple of years, this promise gets broken. Our new superintendent agreed to settle it permanently at a school called TT Minor, and now some school board members are trying to move it again, claiming the school is needed for other population of students. Of course there will always be some other population of students, great ones, whose parents are much better equipped to be advocates. I called one of the school board members who were supporting the idea of moving the school down to Southeast Seattle, a terrible idea, since recent-arrival students come from all over the city, so the school has to be in a central location. She agreed to support our wishes for the school to remain at TT minor. Now, disappointingly, we find out that she turned around 180 degrees again, co-sponsoring a proposal to move the school down to Southeast Seattle. I was staring at the 120 students eating their first Thanksgiving meal, thinking about how much they go through every day and how next year we have no clue where the school is going to be. I was getting more and more pissed off at how crappy and horrible and unfair things are, how in Seattle the loudest voices always win, and how hard it is for our families to be as loud when most don’t speak any English or know how to type, so they can’t email board members or show up at school board meetings to testify. And because of that, their kids keep getting deprioritized and screwed over, in resources, in hope, in morale. “I would have made time,” I said, “Anyway, I’m proud of you.” I was very proud of her, more confident that she would land among the 50% of the kids who will graduate from high school and have a decent chance to succeed. She flashed a grin full of shiny braces and headed off to get some food. Hope is not the Pollyanna “everything will be OK” sort of sentiment, but some sense that one’s actions may lead to something good, that it’s not all in vain, that someone is looking out for you, that adults can keep their promises sometimes, that there is some sort of justice in the world, even if it comes rarely. Hope is what keeps great kids like Hanh going. Hope is one of the most critical things we nonprofits bring to our communities, and when it is not equitably distributed, we must help to bring balance.